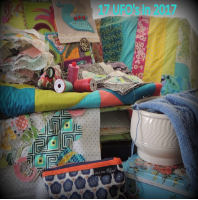 Looking forward to seeing how you get on with your UFOs – a good idea to have a back-up list – I have already changed one of my UFOs, as I realised there was no way I was going to do it! I had the same problem as you culling my UFO’s down to just 17 LOL. wishing you all the best on your 17 challenges. Cheers Glenda Down Under. I’d start with 7, 12 or 15 just to get a thrill from getting one finished in the three weeks we have for the first one. Good luck and look forward to seeing your progress.